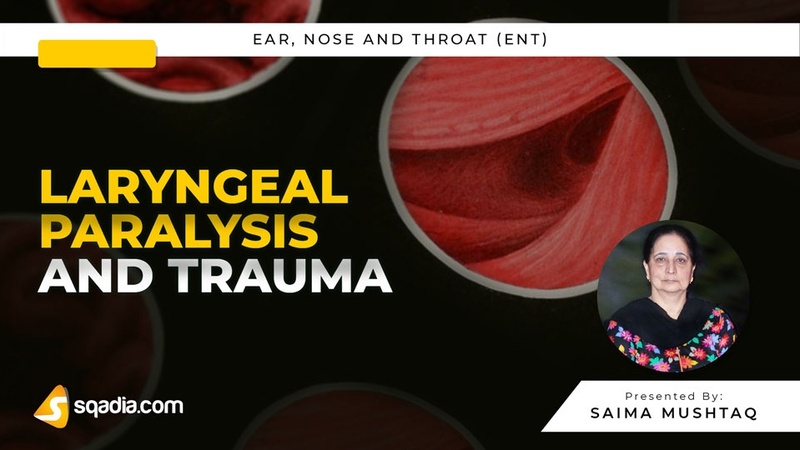 Want to gain knowledge about laryngeal paralysis and trauma? Then this sqadia.com medical video lecture is what you have been searching for. This lecture is a detailed explanation of laryngeal paralysis and trauma. Moreover, all the classes of laryngeal paralysis encompassing superior laryngeal nerve, recurrent nerve paralysis in addition to combined laryngeal and vocal cord paralysis have been comprehensively shed light upon. Furthermore, laryngeal trauma has also been conversed about. In the beginning, nerve supply of larynx and unilateral or bilateral classes have been presented. Classification include supranuclear, nuclear and high vagal lesions. Etiologic factors include systemic (diabetes, syphilis) and idiopathic causes. Paralysis of superior laryngeal nerve (unilateral) along with its clinical features have been explained. 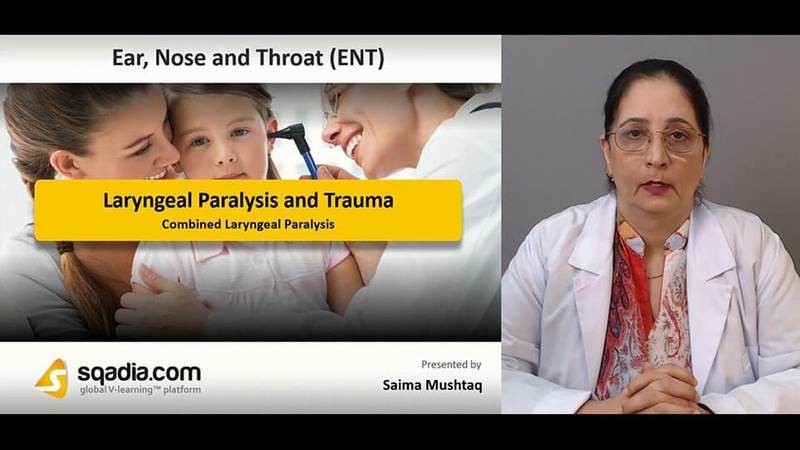 On the other hand, the bilateral category in tandem with its clinical presentation and treatment like tracheostomy and epiglottopexy has been discussed. Primarily the unilateral type has been highlighted. Subsequently, Semon’s law and Wagner and Grossman hypothesis alongside its aetiology has been talked about in-detail. Additionally, clinical features and treatment options have also been elucidated. Moreover, bilateral abductor paralysis, its aetiology and clinical features have been explained thoroughly. Following this amongst treatment strategies, airway widening without permanent tracheostomy, kashima operation, partial arytenoidectomy and thyroplasty II has been delineated. Combined laryngeal paralysis, both unilateral and bilateral category has been explicated. Clinical features and treatment strategies of both the ailments have been conversed about expansively. In addition to this, total laryngectomy and certain diversion procedures have also been highlighted. Unilateral and bilateral congenital vocal cord paralysis has initially been elucidated. Following this, phonosurgery encompassing excision of lesions or injection into vocal cords has been elaborated comprehensively. Moreover, thyroplasty ranging from type I to IV can also be utilized to prevent the aggravation of this condition. Laryngeal reinnervation procedures are also talked about. In the beginning, aetiology of this trauma and its underlying pathology has been shed light upon. Moreover, clinical features and external signs have been conversed about. Diagnostic evaluation can, however, be carried out by either direct or indirect laryngoscopy alongside X-rays and CT scans. This condition can be treated either conservatively or surgically via tracheostomy and open reduction. However, certain complications have also been mentioned.